Stunning executive home in popular Saddle Rock North. Unique combination of location, views, and condition. Backs to golf course on elevated corner lot overlooking the 1st hole. Spectacular unobstructed views of the mountains and golf course. Original owners. Gleaming wood floors, vaulted ceilings, dual staircase, designer lighting, custom paint, ceiling fans through out. Enjoy entertaining from the stylish kitchen with solid surface counters, birch cabinets, gas cook top, built-in double oven, and pantry. Main floor office has amazing custom finish with dual desk and extensive built-in cabinets and shelving. Expansive master suite boasts views from every window and includes five piece bath and large walk in closet. 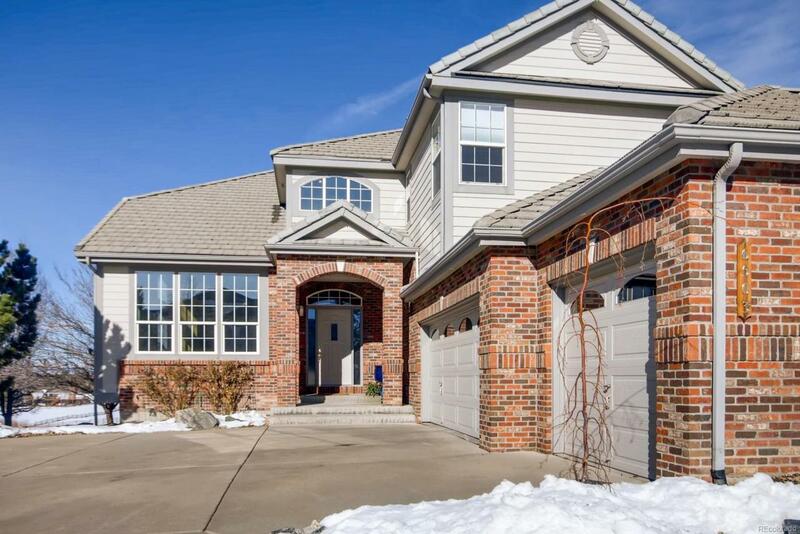 Cherry Creek Schools, Neighborhood pool, tennis and golf. Walking and bike paths connect to Cherry Creek Trail System. Easy access to E470 and quick 20 minutes to DIA. Five minutes to Southlands Mall. Come see all this lovely home has to offer.